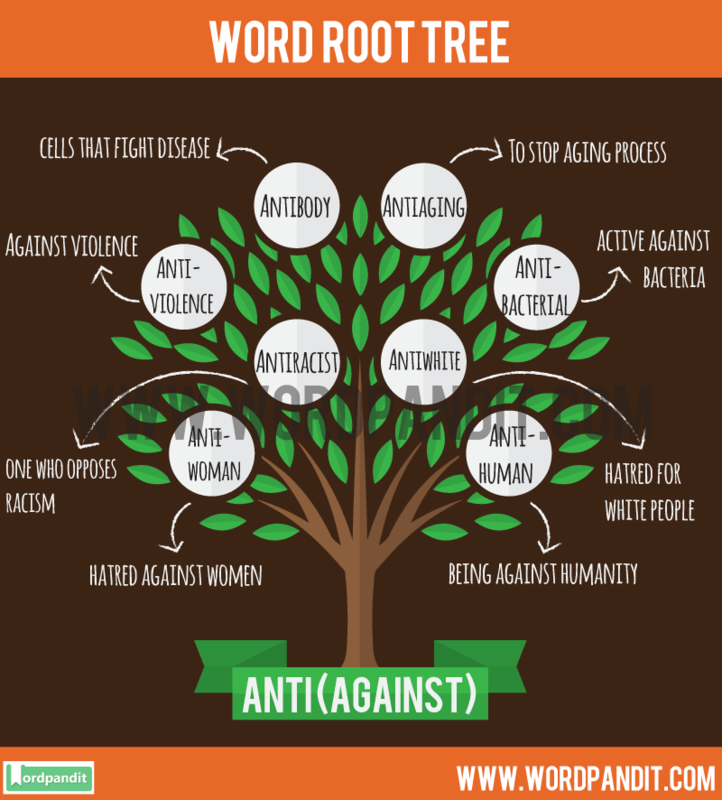 What does the word root ‘anti’ mean? You must have heard a lot of words based on this anti root word. Say, you pop in an antibiotic when you have any infection and as the name suggests its kills the bacteria which are causing the infection and that it is against them. So, we can easily remember that the root word ‘anti’ means oppose to something/ against someone or something /act to prevent something. The best thing about learning through roots is that there might be easy or difficult words from the same root word and you can learn all of them together through this method. So, if you come across the word Anti-Semitism you would be able to understand that it’s against something, which is a very important part of the meaning of the word as it means being against or being hostile towards Jews. Anti + pathy= a strong feeling of dislike which is opposite to sympathy. 4. Antidote : Something that corrects or improves the bad effect of something. 13. Antidandruff : One that stops growth of dandruff. 14. Antiamerican : One who hates american. 16. Antialiasing : A software technique to remove jaggies in order to make signal smoother. An easy root like the Anti root word can help you remember a few difficult words. Also, whenever you will come across a word that is formed from the same root word Anti, you will be able to understand the word in context.